Want to really know how to wear Bengali saree with a twist this Durga Puja? Read on to find out! This Durga Puja, stand out from the crowd by draping your traditional saree in a slightly different way. While the classic Bengali saree is an extremely elegant style, the semi drape is a version that is sure to make you the centre of attention. Want to know how to look traditional yet different and unique this Puja season? Read on to find out how to DIY – drape it yourself! 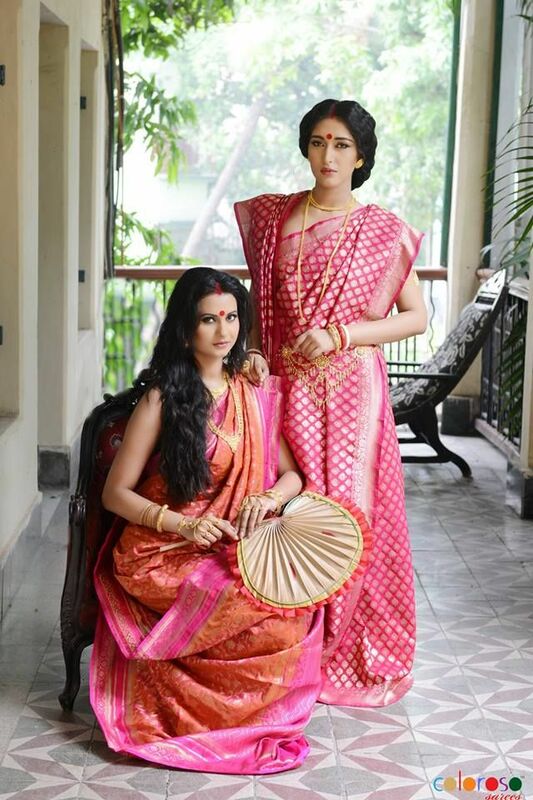 Pick a traditional Bengali saree with a thick border to ensure that the style is maximized. Once you have worn your petticoat, start by tucking in the end of the saree into your petticoat from the right side. Take it all the way around your waist and tuck it in smoothly to avoid any unwanted ruffles. When you bring it back to the front, tuck it in neatly at the centre. Now take the pallu, and make broad pleats that show off the border of the pallu well. Place the pallu over your left shoulder and make sure that the end reaches below your knee level. Arrange it neatly so that the design and border are clearly visible and then secure it near the shoulder using a safety pin. Next, move to the front of the pallu, gather all the pleats neatly and secure it below the bust. Now, use the remaining fabric, and leaving about ten inches from the end of the pallu, start making pleats that will be tucked in at the waist. Carefully make neat pleats and secure it at the front of the saree waistband. Next, take the pallu that you had draped over your shoulder and pull the end around your back and bring it to the front near the bust. Pull it under your right arm and layer it across your bust and under the pallu. Secure it at the blouse under the pallu so that it looks neat and unwrinkled. Pull it out from under the pallu and under the left arm across your midriff and secure it at the end using a pin. Voila, that’s how simple it is. Your Bengali saree drape with a twist is done. With this style, your right shoulder will not be covered so you can have some fun with your blouse. Go for a halter neck, or a thin spaghetti style blouse to show off your slender shoulders and collarbones. You can also opt for a strapless blouse and deck up your neck with a statement neck piece. If you choose a traditional red and white saree, you can wear beautiful, oversized oxidized silver jewelry. If the base color of your saree is darker, like a black or maroon, then opt for darkened gold or Kundan style jewelry. You can also wear large bracelets and kadas on your wrist instead of the dainty bangles and have fun with a spirited style this Durga Puja.